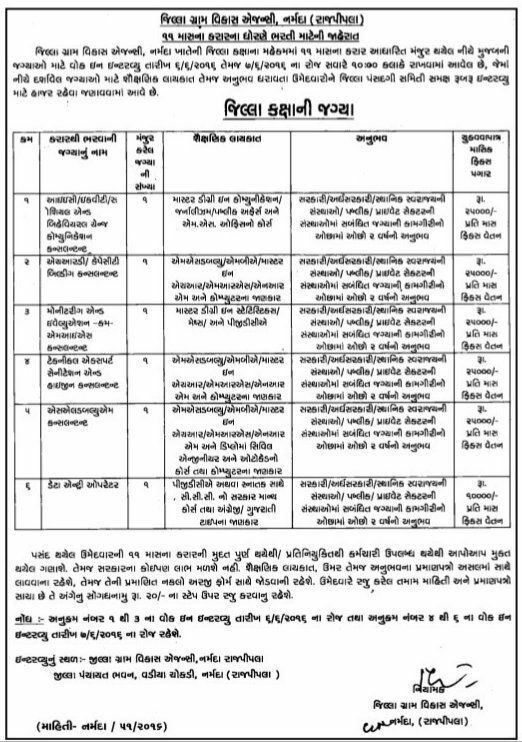 District Rural Development Agency (DRDA), Narmada (Rajpipla) published notification for recruitment for Various Consultant & Data Entry Operator posts on 11 months contractual bases under Clean India Mission (Rural). Master Degree in Communication / Journalism / Public Affairs & Candidate must have basic knowledge of M.S. Office Computer Course. M.S.W. / M.B.A. / Master in HR / MRS / NRM & Candidate must have basic knowledge of M.S. Office Computer Course. M.S.W. / M.B.A. / Master in HR / MRS / NRM / Diploma in Civil & Candidate must have Auto cad Course knowledge of Computer. PGDCA OR Any Graduate with Computer knowledge CCC with Gujarati / English Typing & Data Entry with good speed knowledge required..
How to apply: Eligible candidates may attend walk in interview along with application, bio-data, original certificate of one set of photocopy or relevant document, one passport size photographs to given below address.